Our Premium Lockable Poster Cases with Top Hinges are for use indoors or outdoors. They are secured with key locks in the door and they have waterproof seals. 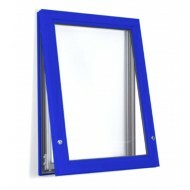 They feature a heavy duty aluminium frame, gas door struts and a push lock mechanism to allow easy door opening for quick poster replacement. They have has 5mm correx back paneling and a 6mm PETG front with a waterproof seal and top hinges to protect your graphics. Our premium locking poster cases are manufactured to order at our UK plant to a colour of your choice, with 213 RAL colours available. Our Premium Top Hinged Secure Poster Case is ideal for smart, classy displays.